ARTICLE I. 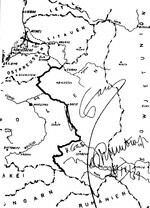 The Government of the German Reich and the Government of the USSR determine as the boundary of their respective national interests in the territory of the former Polish state the line marked on the attached map, which shall be described in more detail in a supplementary protocol. ARTICLE III. The necessary reorganization of public administration will be effected in the areas west of the line specified in article I by the Government of the German Reich, in the areas east of this line by the Government of the USSR. ARTICLE IV. The Government of the German Reich and the Government of the USSR regard this settlement as a firm foundation for a progressive development of the friendly relations between their peoples. The Government of the USSR shall place no obstacles in the way of Reich nationals and other persons of German descent residing in the territories under its jurisdiction, if they desire to migrate to Germany or to the territories under German jurisdiction. It agrees that such removals shall be carried out by agents of the Government of the Reich in cooperation with the competent local authorities and that the property rights of the emigrants shall be protected. A corresponding obligation is assumed by the Government of the German Reich in respect to the persons of Ukrainian or White Russian descent residing in the territories under its jurisdiction. The Secret Supplementary Protocol signed on August 23, 1939, shall be amended in item to the effect that the territory of the Lithuanian State falls to the sphere of influence of the USSR, while, on the other hand, the province of Lublin and parts of the province of Warsaw fall to the sphere of influence of Germany (cf. the map attached to the Boundary and Friendship Treaty signed today). As soon as the Government of the USSR shall take special measures on Lithuanian territory to protect its interests, the present German-Lithuanian border, for the purpose of a natural and simple boundary delineation, shall be rectified in such a way that the Lithuanian territory situated to the southwest of the line marked on the attached map should fall to Germany. After the Government of the German Reich and the Government of the USSR have, by means of the treaty signed today, definitively settled the problems arising from the collapse of the Polish state and have thereby created a sure foundation for a lasting peace in Eastern Europe, they mutually express their conviction that it would serve the true interest of all peoples to put an end to the state of war existing a present between Germany on the one side and England and France on the other. Both Governments will therefore direct their common efforts, jointly with other friendly powers if occasion arises, toward attaining this goal as soon as possible. Should, however, the efforts of the two Governments remain fruitless, this would demonstrate the fact that England and France are responsible for the continuation of the war, whereupon, in case of the continuation of the war, the Governments of Germany and of the USSR shall engage in mutual consultations with regard to necessary measures. "With reference to our conversations I have the honor to confirm herewith that the Government of the USSR is willing on the basis and in the sense of the general political understanding reached by us, to promote by all means the trade relations and the exchange of goods between Germany and the USSR To this end an economic program will be drawn up by both parties, under which the Soviet Union will supply raw materials to Germany, for which Germany, in turn, will make compensation through delivery of manufactured goods over an extended period. Both parties shall frame this economic program in such a manner that the German-Soviet exchange of goods will again reach the highest volume attained in the past. Both Governments will at once issue the necessary directives for the implementation of the measures mentioned and arrange that the negotiations are begun and brought to a conclusion as soon as possible." "Implementing my letter of today about the formulation of a common economic program, the Government of the USSR will see to it that German transit traffic to and from Romania by way of the Upper Silesia-Lemberg-Kolomea railroad line shall be facilitated in every respect. The two Governments will, in the framework of the proposed trade negotiations, make arrangements without delay for the operation of this transit traffic. The same will apply to the German transit traffic to and from Iran, to and from Afghanistan as well as to and from the countries of the Far East." "Furthermore, the Government of the USSR declares that it is willing, in addition to the quantity of oil previously agreed upon or to be agreed upon hereafter, to supply a further quantity of oil commensurate with the annual production of the oil district of Drohobych and Boryslav, with the proviso that one half of this quantity shall be supplied to Germany from the oil fields of the aforesaid oil district and the other half from other oil districts of the USSR. As compensation for these supplies of oil, the USSR would accept German supplies of hard coal and steel piping."